“As an instance of socialization, the rites make the silence audible that traverse the teachings of the “use” of the body in the family, whether through the meanings that are given to the sexual division of labour, or through the “mute” prohibitions and taboos that format gender identities and, within these, sexual identities. 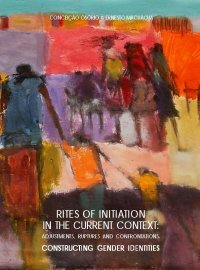 In the same way, as the rites are of initiation, they initiate the youth at a stage of their life cycle, in their transition to the adult world, with a socially determined and accepted order and hierarchy. Having as target group girls and boys between 12 and 18 years (subjected to the rites) attending grade 7, the research aimed at identifying the role of the rites in shaping social identities, particularly sexual identities, and how the “ritual education” may shift an interest in the school to marriage or work. Our approach is based on an analysis of the material and symbolic mechanisms developed by the ritual teachings and by the means used for their agency, seeking at the same time to recognise signs of contestation that may enhance changes in the embodiment and subjectivation processes. By taking female and male teachers as reference group we intend to establish by evidence the existence, or not, of differentiated normative patterns in the construction of manhood and womanhood.